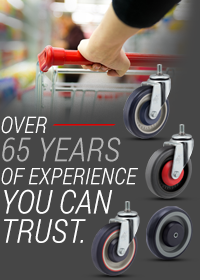 E-Line is Pemco’s new line of competitively priced casters and wheels. 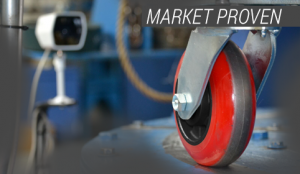 Mass-inventoried, the E-Line features a wide assortment of 2-inch wide casters capable of many different configurations to meet your need and budget. 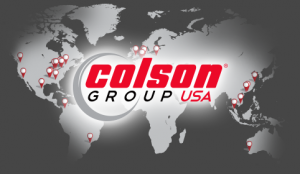 Explore the Configurator on the right to customize a Part Number with varying options, to download CAD models in your native format, or Add to a Quote request. Use the tabs above to learn more about the Tread Types and other available Options. 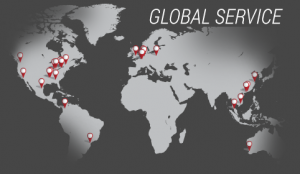 Four stocking locations across the United States, and more globally, allow for rapid and efficient fulfillment of customer orders. The E-Line is available as assembled casters or component parts. 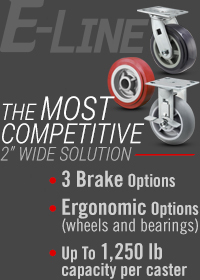 E-Line is flexible to meet your specific needs, with USA-made options, four wheel diameter sizes, ten tread types, and four brake types, all of which are available in swivel or rigid mounts. 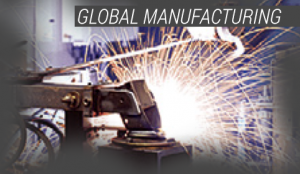 High temperature industrial use up to 600°F – must use optional steel retainer washers (SW). The following options are compatible on both swivel and rigid casters. 1. Cam Brakes require Roller Bearing. 7″ Cam Brake will not work on 4″ casters. 2. Plastic Thread Guards only available on Thermo-Rubbert Flat and Thermo-Rubber Donut wheels in 5″, 6″, and 8″ diameters. 3. The PolyKat Precision Ball Bearing is standard on PolyKat wheels; it is not an option for other wheels. Plastic retainer washers come standard on wheels with roller bearings. Steel retainer washers are an available alternative. Rubber raceway seals keep dirt out and lubricant in for longer caster life.